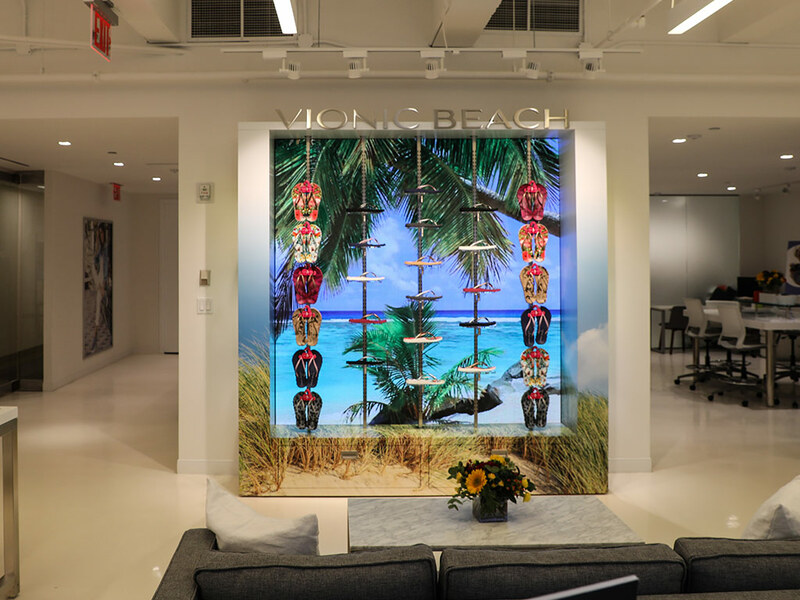 Bringing together style and science, global footwear brand Vionic Shoes has seen a continued growth which prompted a recent move into a new showroom space located at 1370 Avenue of Americas in New York City. In this new environment where reps and buyers would be enticed to purchase the latest innovative shoe designs for their retail locations, a new brand was also being launched, Vionic Beach. Needing a way to make sure the latest in life-changing footwear didn’t get lost on the showroom floor, the retail presence and showroom designer David Warwick created a unique and immersive LED video beach experience using FLEXLite II 3.9mm LED from PixelFLEX™. Knowing now he wanted to use LED video for the retail design, Warwick began to take a look at industry examples of what the technology could do. Searching online, he came across one solution that was right in line with what he was looking to create, and that also led him to PixelFLEX™. Ready to move forward with a PixelFLEX™ solution, Warwick began to work with the team in Nashville to find the right technology. Not wanting to be held back by product limitations, he was happy to find the many PixelFLEX™ options available that would be powerful enough to create the new environment, while simple enough for a showroom manager to control. With the FLEXLite II LED video solution identified, the team got ready for the installation in the new showroom, but as part of a larger installation, the LED video needed to go up quickly and easily in order to keep the opening on schedule. Now open to customers, suppliers, business partners and media members wanting a look at the latest Vionic Shoes innovations, the new LED video design for Vionic Beach is performing beautifully. Taking visitors on a quick trip back to a relaxing memory of sand between their toes, the FLEXLite II LED display is using the power of digital media make a true connection in the retail experience. An American-based LED manufacturer, PixelFLEX™ offers creative solutions, reliable products, and dependable service for our industry-leading LED display technologies and solutions. Driven towards excellence to meet your standards, PixelFLEX™ offers a one-of-a-kind design for your tour, event or installation through our award-winning line of LED video walls and video screens. Working with architects, designers, engineers and consultants, PixelFLEX™ is proud to develop custom LED solutions for each and every customer while also providing top-tier customer support throughout the entire experience. Hunke jewellers and opticians is a family business with a long and rich tradition in the town of Ludwigsburg, Germany. Situated in the centre of one of Europe’s most renowned baroque cities, the owners planned to fuse the historical, traditional townhouse which hosted their established store with a newly built, neighbouring corner house. In consequence, the interior design concept was meant to be a one-of-a-kind fusion of past and future elements, using premium materials. The aim of the lighting concept was, to underline and sharpen this approach. The ambient lighting in the jeweller’s part oft the store is generated by large fields of illuminated ceilings, integrated in an accurately shaped drywall ceiling structure. Random arranged spheres of diffuse glass complete the ambiance and serve as illumination for the facial area. The bright and brilliant product lighting is generated by recessed, adjustable downlights with reflectors made of dichroic glass, again integrated in a custom made drywall ceiling construction. The showcases are illuminated by a combination of two lighting principles: the back wall is brightened up from top to bottom by a diffuse linear LED-strip, and the products are highlighted by directional miniaturized spotlights with different beam angles and colour temperatures. An elaborate filter layer behind the shopwindows generates a fascinating link between exterior and interior: a glass pane, printed with a gradient and supported by floor-integrated linear lighting, generates transparence as well as privacy. The very centre of the store is the two-storey lounge area, situtated in the oldest part of the building. It is dominated by a golden ceiling setback with a bundle of 40 custom made glass pendants in a random arrangement. In the opticians store, an accurately arranged system of thin black ceiling lines with integrated track lighting provides an optimal flexibility for the different requirements of the illumination. A combination of glare reduced downlights (circulation areas), wallwashers (showcase walls) and powerful linear lighting (consultant tables), accompanied by directional spotlights (shelves and tables) create a well balanced, glare reduced lighting atmosphere.